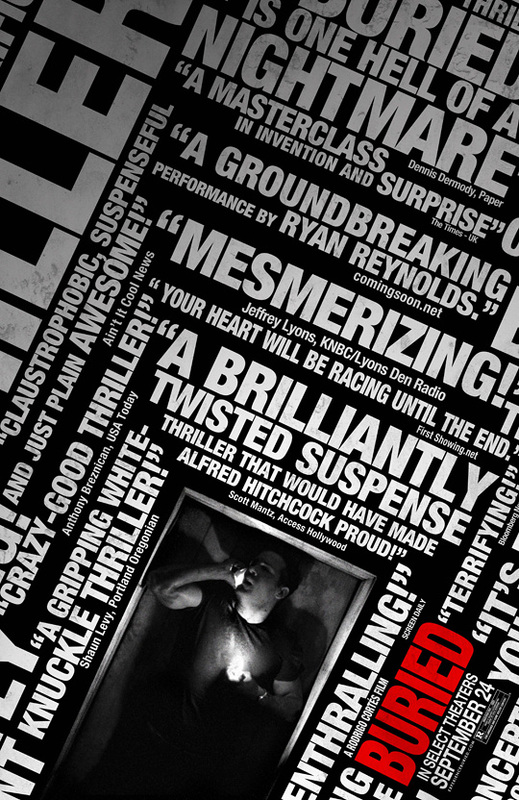 New Poster for Ryan Reynolds' Buried Debuts with FS Quote! This is awesome! Our friends at Ain't It Cool News just unveiled a new poster for Ryan Reynolds' upcoming buried alive thriller Buried, directed by Spanish filmmaker Rodrigo Cortés (who I'm planning to interview in Toronto). This poster takes that stunning, twisty Saul Bass-like design that we originally saw made out of white lines and inputs some quotes (including one from yours truly at FirstShowing.net via this review) for the movie. I hope this helps build even more buzz because I loved Buried, it's still one of my favorites of this year, and I hope a lot of people go see it. Anyway, without further ado, check out the new poster for Buried! If you haven't seen a trailer yet, you should watch the full theatrical one or the much creepier teaser trailer. A U.S. contractor working in Iraq awakes to find he is buried alive inside a coffin. With only a lighter and a cell phone it's a race against time to escape this claustrophobic death trap. Buried is directed by Spanish filmmaker Rodrigo Cortés, of the films 15 Days, The Contestant, and Dirt Devil previously. The screenplay was written by first-time writer Chris Sparling. This was one of my favorite films from Sundance (read my review) and I can't wait for everyone to be able to experience it! Buried hits ALL theaters on October 8th. That's awesome guys! Cool poster too. Very cool Alex. But which is cooler, getting on this poster or Brothers Bloom? love the poster. can't wait to see the movie! Okay, he's buried and no one would like to experience it; now all together every one: Oooh, ahhhh ! ...Yaaawwnnn ....Unless he escapes the way the Bride did, it seems like it's just going to be 2010's over rated critcs Oscar darling to me .... Pass. Sam Shadey I think you will be surprised. Have you seen it Xerxex or are you just getting caught up in the pre hype the way everyone did with Avatar? Sam Shadey, see for your self and read the script, It's been floating online for a good year now. Nice, recognition this site deserves. I just wanna see how they can pull off such a concept ASAP. Finally some recognition! Great work, guys! Have you seen it Sam Shadey or are you just getting caught up in the pre anti-hype the way everyone did with Avatar? Sam Shadey I happened upon the script and I was thoroughly impressed with the plot, it was heartbreaking, and a excellent thriller. p.s. I wasn't caught up in the Avatar hype, I learned my lesson after The Dark Knight, and I was glad I didn't Avatar wasn't that good. Il'll join the hype, guess i'm a glass is half full, kind of guy. Should be entertaining! I've been excited since I heard about the concept and Ryan Reynolds' involvement. This poster rocks too! That's what I'm talkin' about. Great job guys and congratulations. The trailer was shown before Predator yesterday. Can't wait for it! Xerxex, I'll take you word on it and wait until the first weekend of release is over before deciding. I usually wait to hear/read what other ordinary 'paying' movie fans say about a movie rather than star struck critics who get complimentary tickets from studios to review their movies. OoOoOoOoO... I suppose you guys are going to let all this fame go to your heads, and pretty soon you'll be dismissive and unapproachable! Seriously, you earned it. Way to go! @Sam Shadey I'll be sure to let you know I thought of it. @Hedgehog nice miss-uses of parentheses!